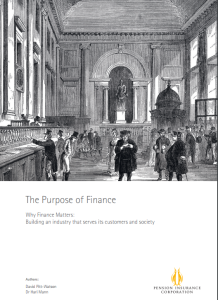 What is the purpose of finance? And what would the financial services industry look like if it were designed around this underlying purpose? This dinner is the first in a rolling series of events hosted by New Financial and supported by Pensions Insurance Corporation that will explore the purpose of finance and the purpose of different sectors of the industry, from asset management to stock exchanges, and investment banks to regulators. The overall project is run by David Pitt-Watson, executive fellow of finance at London Business School, and Dr Hari Mann, professor of strategy and innovation at Ashridge Business School. The audience will be a range of senior executives and policymakers from across the industry. David Pitt-Watson is a leading thinker and practitioner in the field of responsible investment and business practice. He is currently Executive Fellow of Finance at London Business School. Until the end of 2012, he was Chair of Hermes Focus Funds, and a former board member of Hermes Fund Managers. As co-founder and former Chief Executive Officer of the Focus Funds and Equity Ownership Service; he built and led the largest responsible investment group of any institutional fund manager in the world. Throughout his career he has been deeply involved in policy making in the UK, Europe and around the world particularly in the area of corporate governance and financial regulation, and is the author of books on this topic, most recently What They Do with Your Money, published by Yale University Press. He is a non-executive at KPMG and Treasurer of Oxfam. Hari is a Professor of Strategy and Innovation at Ashridge Business School focused on Executive Education. Through his career, he has worked within academia, investment banking, politics and early stage entrepreneurial ventures. In 2010, he was made Director of Tomorrow’s Investor, a project run by the Royal Society of Arts focused on how to deliver better pensions in the UK. He holds an MSc (with distinction) and a PhD from the London School of Economics. He is also a Visiting Fellow at CASS Business School, City University. Hari has worked with David over the past seven years on a series of publication under the Tomorrow’s Investor project. These have focused on how to deliver a better pensions architecture in the UK, how to lower investment costs in UK pensions and what can the UK learn from other countries in the world around pension fund management. His other research is focused on the areas of strategy, innovation and entrepreneurialism.